The UAE have come a long way in the last few years, but it is how far their potential can carry them that should have rugby fans in the Emirates really excited. Performances and professionalism have come on light years since fellow dual code Samoa international Apollo Perelini took the helm in October 2015. His first tournament as coach led to the UAE blitzing Uzbekistan and Thailand to storm to the Asia Rugby Championship Division II title last May, and a similar performance against Malaysia, Sri Lanka and the Philippines this May could be the beginning of an unbelievable, if unlikely, road to the 2019 Rugby World Cup in Japan. Things didn’t always look this bright. In April 2014 the UAE were beaten 30-13 by Singapore to relegate them from Division I of the ARC. It meant successive relegations, having dropped out of the top tier Asian Five Nations in 2013 under Duncan Hall. Whereas the UAE once regularly played the Asia powerhouses of Japan and Hong Kong on a regular basis, however, encounters were complete mismatches; May 2011’s 111-0 hammering at the hands of Japan the UAE’s record defeat. Performances were hardly better prior to that. From 1993-2010, Emirates-based players qualified to play for the Arabian Gulf – a combined team of players from Arab states – prior to the UAE breaking away to form its own union and becoming the IRB’s 100th member in 2011. Their record defeat was also against Japan, a 114-6 mauling in May 2008. Being relegated to Asia Rugby’s third tier has actually turned out to be to the UAE’s benefit. Progress was steady under Hall’s replacement, Roelof Kotze. The South African’s team narrowly avoided bouncing straight back to Division I with the width of a rugby post in May 2015, handing Malaysia a 20-19 victory which ultimately saw them promoted at the UAE’s expense. Now under Perelini, forward strides are being taken. Abu Dhabi Harlequins flanker Ben Bolger, one of the finest players in the Emirates, became eligible last year and captained the squad that steamrollered Uzbekistan 63-13 and Thailand 70-18. Fellow Quin Luke Stevenson and Dubai Exiles skipper Glenn Moore will be available to Perelini for this season’s assault on Division I and that, combined with the rapid year-on-year improvement of the domestic game, is lending substance to belief the UAE could be on the cusp of something special. Joost van der Westhuizen was a popular figure in the UAE. I had the privilege to play with a young Joost van der Westhuizen for Northern Transvaal when we were both in our early 20s. He made it very easy for me as a No10 by always taking a lot of pressure off me because, even at a young age, Joost had a great kicking game and an excellent pass. I will always remember how he made it look as if he had more time on the ball than anyone else. It was an ability he made best use of as he always made the right decision whether it was kicking, passing or taking the opposition on with his turn of pace. He was a great player but also a great guy who had the respect of so many in the game beyond his team-mates and those who knew him. He was much-loved in South Africa because at a time when a number of players were being offered huge money to play overseas he remained loyal to Transvaal. Loyalty also being a mark of what defined him as a person. The bigger the game, the more he enjoyed the challenge and delivered time and time again at domestic and international level. His consistency throughout his career was remarkable. He will always be remembered as the player who started the new generation of half-backs. 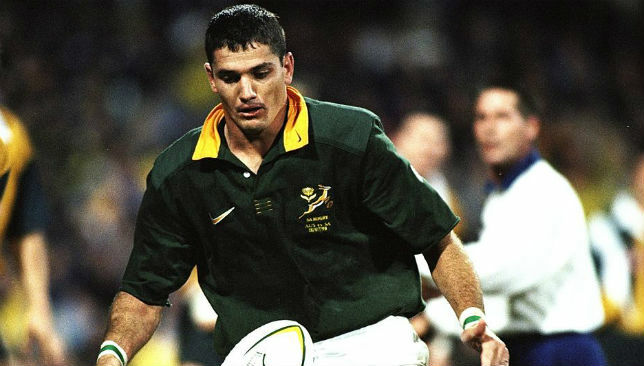 Joost was not the stereotypical No9 and definitely forever changed both how scrumhalfs played. He was exciting to watch with ball in hand, attacking defences, had a great pass and a magic kicking game with his left foot. But he was also a really aggressive defender not afraid to take the forwards on and was an excellent leader on the pitch. His understanding of the game and his support lines were a pleasure to witness over such a fantastic career. The rugby community has lost an inspirational and wellrespected sportsman. Joost never stopped fighting the disease and once again showed his spirit, but in a different way. He was an unbelievable competitor on the field and that translated into his personal life. 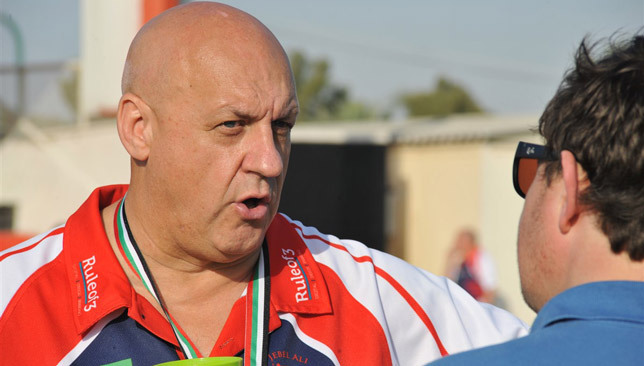 Jacques Benade is Director of Rugby at Dubai Exiles and a former South Africa A captain. The UAE Conference has reached the business end of the season with results and standings suggesting the Top 6 title could provide a thrilling finale to the 2016/17 season. Jebel Ali Dragons 2nds topped the table after 10 games but the league’s 11 teams now split into the Top 6 and Bottom 5 competitions, with the winner of the Top 6 being crowned Conference champion. Last season was a straight shootout between Dragons and Sharjah Wanderers, with the two teams saving arguably the greatest game of the campaign for the final, where Nic Walters’ Wanderers came from 16-0 down to claim an epic 27-26 win in the final minute to lift the trophy and preserve an impressive unbeaten season. This season’s Conference has already thrown up a host of interesting storylines, and it will be fascinating to see them play out once the Top 6 begins a week on Friday. Dragons have maintained their status as one of the title favourites. Robbie Cameron’s men would surely have been looking at replicating Sharjah’s unbeaten run to last season’s championship, but they were thrashed 41-18 by Abu Dhabi Harlequins 2nds in the final league game on Friday. They are nevertheless one of the main sides to watch, having won nine of their 10 games, claiming a 27-19 triumph against second-placed Dubai Exiles 2nds when the two sides, at the time both unbeaten, met in a top of the table clash at The Sevens in December. In a day of intriguing results last Friday, Gareth Venter’s Exiles also suffered only their second defeat in 10 games, going down 39-34 to Dubai Hurricanes 2nds, a result which helped them secure their Top 6 berth. In 10 games, Exiles boast the best defence, having allowed just 96 points, while they have also accumulated a magnificent nine bonus points – again the most of any team in the division. The highest scorers heading into the Top 6 are Quins, who have accumulated 435 points on their way to winning seven games from 10 to finish third in the overall table. The reigning champions have given themselves a chance of retaining their title, although life has been far from plain sailing a year on from their trophy win. Three opening wins were followed by three straight defeats. They suffered another to make it four defeats and six wins, although their latest victory saw them topple Quins 40-31 on January 20. Canes finished fifth, a point below Sharjah, which means just 14 points separated fifth and first, which adds to the feeling the Top 6 will be hugely competitive. Even Al Ain Amblers 2nds, who scraped into the Top 6 after finishing level on 24 points with Heartbeat Tigers thanks to a superior points record, will feel they have a shot after enjoying a resurgence in recent months. The Garden City side lost four of their first five games and certainly felt the force of their senior side withdrawing from the West Asia Premiership, having suffered a mass exodus of players to rival teams over the summer. Slowly but surely though, Amblers clawed their way back and won four of their last five matches to earn a spot in the Top 6. They did it in style too, amassing eye-catching wins against Tigers (90-7), Sharks (76-10) and Sarries (63-10), with the Tigers triumph the league’s joint highest score and second largest margin of victory. Elsewhere, in the Bottom 5, Dubai Sharks or Heartbeat Tigers might be considered the favourites to end the season with silverware. Tigers finished seventh thanks to a 20-0 victory on Friday courtesy of a forfeit due to Dubai Wasps’ injuries, while Sharks came eighth after an entertaining 39-24 triumph against Arabian Knights. Tigers’ six bonus points gave them the edge despite winning one less game than Adrian Cartwright’s side, with Knights, Wasps and Abu Dhabi Saracens the other three teams in contention.